Thank you for your interest in expanding your knowledge about the United Nations. 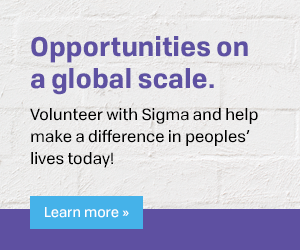 The Honor Society of Nursing, Sigma holds special consultative status with the Economic and Social Council, and we appreciate your commitment to provide a strong nursing presence at the United Nations. This document provides options and instructions for scheduling a tour of the United Nations in New York, New York, USA. NOTE: UN Headquarters may be closed to the public at various times throughout the year. Please check their website for the most up-to-date information. All times listed are on United States Eastern Time. Lunch is offered Monday through Friday from 11:30 a.m. to 2:30 p.m. Ticket prices range from US $13.00 to $22.00.Group rates are also offered. A limited number of same-day tickets can be purchased on site for the next available tour. You can request a briefing when planning to visit the United Nations Headquarters in New York.If you are not traveling to New York, you can request a briefing by videoconference/Skype or host a UN speaker at your own location. Visit the online speaker biographies and backgrounds, which are examples of the types of speakers available. Speakers are usually chosen for a briefing based on the topic requested and their availability. Room availability is very limited.Arrangements for rooms and speakers are subject to change.Briefings are considered on a first-come, first-served basis. Briefings at UN Headquarters are available on weekdays from 10:30 a.m. to 4:00 p.m. These briefings are normally private briefings one hour in length.If another group is interested in the same topic at the same time, permission will be asked to jointly host. Rental of venues outside UN Headquarters (if no conference rooms are available at Headquarters). To host a UN speaker at your location, the inviting organization is responsible for the speaker’s travel, terminal expenses, lodging, and hospitality costs.UN speakers cannot accept any honoraria. For any questions contact: Briefings@un.org or call 1-212-963-7710. Organized each Thursday morning from the end of September to the second week of June. If you have any questions about the above information, feel free to call Rebecca Schafer, Global Initiatives Advisor, at 317-917-4918 or email global@stti.org. The Sigma United Nations liaison and youth representatives are happy to provide information to assist in scheduling a visit to the United Nations. Should you decide to design a program involving any aspect of the United Nations, please let us know. It would be wonderful to hear what was most worthwhile as that could help us refine our resource list. UN Website is the window to the United Nations. It provides an overview of the organization and its daily activities. Available in six official languages of the United Nations (Arabic, Chinese, English, French, Russian and Spanish). UN Calendar of Conferences and Meetings lists scheduled meetings and can be sorted by date, venue, or year. UN News Centre is a one-stop online source for breaking news on all the activities of the United Nations system around the globe, in the six official United Nations languages. The UN Web TV Channel and United Nations YouTube Channel are the organization’s official online video platforms to watch United Nations live and on-demand from wherever you are. Available 24 hours a day. United Nations Photo provides daily coverage of the United Nations globally; it also offers a wide array of historical images since the 1940s when the organization was founded. Available online for high-resolution download. United Nations Radio produces daily news, interviews, and features in the six official languages, plus Kiswahili and Portuguese, as well as weekly programs in Bangla, Hini and Urdu. Sound clips and all audio are available as mp3 files for rebroadcast. Sometimes video clips are added online and on social media. United Nations Meetings Coverage and Press Releases provide coverage on meetings and conferences, as well as background information and other assistance for the media. The United Nations on Social Media provide United Nations multimedia content in the six official languages of the United Nations. United Nations Audio Channels - Android Apps on Google Play and United Nations Audio Channels - iPhone Apps provide live coverage of United Nations meetings and United Nations radio programs in eight languages. United Nations News Reader - iPhone App and United Nations News Reader - Android Apps on Google Play provide latest United Nations news from around the world in six languages. UNifeed provides video news content for reporting. Unietd Nations Audiovisual Library of International Law holds a unique collection of prominent world events dating from the early 1940s, when the organization was established, including a catalogue of United Nations film and video. Learn more about the United Nations General Assembly. Learn more about the United Nations Security Council. Learn more about the United Nations Economic and Social Council. Learn more about the United Nations Trusteeship Council. Learn more about the International Court of Justice. Learn more about the United Nations Secretariat. Learn more about the United Nations Secretary-General.